The death of Nelson Mandela has turned the attention of the world to South Africa and its long struggle to build a nation where all of its people will be free and safe. Mandela’s towering figure overshadows all of the other people who contributed in one way or another to developing a free, democratic South Africa. The major glory of the transition of power certainly belongs to him and to the ANC, but let’s take some time to honor the often-ignored and forgotten voices of others who fought for a better South Africa. In August, 1986, the respected New York Times columnist William Safire wrote about Helen Suzman and her lonely fight for equality in South Africa. At that time the argument in the United States and Europe was mainly about whether other countries should impose sanctions on South Africa. The quest for real political equality seemed unreachable. Safire wrote in his article, “No democrat can oppose the idea of majority rule, but no realist thinks the outside world can bring it about now or soon. Forget about the imposition of black rule in this decade; it will not happen.” And yet in that same year, 1986, Nelson Mandela was beginning his negotiations with all-white government for his release and a new model in the country. In 1990, Mandela was released from prison and in 1994, eight years after Safire’s article appeared, he was elected president of a multiracial South Africa. The prophecies of even the wisest pundits often turn out to be wrong. thirteen years from 1961 to 1974. Eventually more Progressive members were elected to parliament and the apartheid government was put under greater pressure to change some of its rigid laws. 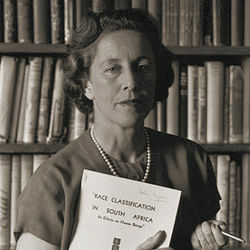 Helen Suzman was a popular anti-apartheid voice around the world although her opposition to economic sanctions during the 1980s made her unpopular even with anti-apartheid opponents. On American college campuses she was sometimes booed instead of cheered because of her unwillingness to support sanctions. It is not easy to fight for many years for a cause that separates you from the majority of the people you grew up with and who consider themselves your natural social group. Cast out by many white South Africans, Helen Suzman could not share completely in the life and experiences of Black South Africans either. Always an outsider, she nonetheless continued her struggle and finally saw South Africa take great strides toward becoming a truly multiracial and democratic society. As she grew older and South Africa changed, Helen Suzman received many honorary degrees from universities around the world and was named a Dame of the British Empire. She died in 2009 at the age of 91. You can read her views about her life and work in her memoir. In No Uncertain Terms: A South African Memoir (1993). I don’t respond often enough to let you know how much I enjoy reading your postings, Adele. I hope that one day they may be compiled as a “women of courage” anthology. I’m glad you enjoyed the piece. Helen Suzman was a fascinating woman and a true heroine. This is another wonderful post! It’s fascinating to find out about this woman, who certainly deserves more attention than she has gotten in the recent flood of articles about South Africa.